I don't particularly like fish tacos; I find them to be bland. I've had them in different places, but no matter how many toppings were added to the rather plain fish, they were all meh to me. Then I had them at Grille 620 in Ellicott City. The ones I had there were wrapped in flour tortillas, rather than the usual corn, and I think it made all the difference. Flour tortillas have relatively little flavor, so the elements inside can sing out. Corn tortillas have a little more going for them, and I feel they work better with bolder fillings. 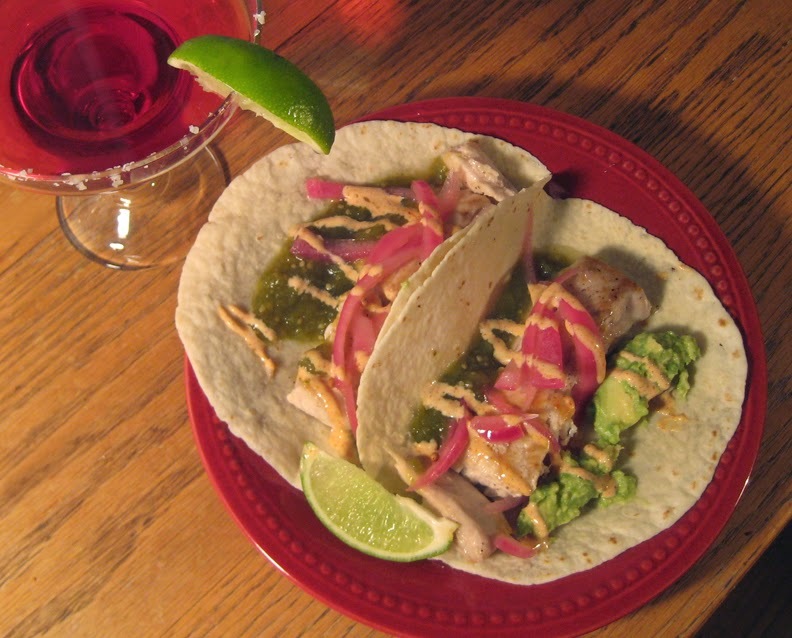 Fish tacos usually involve some sort of white fish, plus a slaw, and a crema. Lots of times there will be pickled onions involved, too, which is my favorite part. Oh, and guacamole. I also added a tomatillo salsa, which is easy peasy to make, and tastes great on just about any other kind of taco you can imagine as well. Combine the vinegar, sugar, and salt in a pint jar. Put the lid on and shake vigorously to dissolve sugar and salt. Slice the red onion thinly and place into a colander or sieve. Put a couple cups of water on to boil; when boiled, pour over the red onion in the sieve. Shake all of the water off, then pack onion into the jar. If the vinegar doesn't come up over the onion, add a little more. Seal jar and refrigerate for at least an hour.